According to “日本イスラーム史” (nihon Islamu-shi), written by Fujio Komura, published by 日本イスラーム友好連盟 (nihon Islamu-yuko-renmei), 10 Tatar families migrated to Japan in 1926, after being deprived the freedom of religion in Russia. They established a group, 名古屋回教徒団 (nagoya kaikyo-kyoudan) in March 1931. The house of Sayed Ghalief, who was in charge of accounting, is reported to have been used as their prayer space for the 5 daily prayers as well as the Friday prayer. This became the first ever Mosque in Japan recorded in history. In a document, “名古屋ムスリムモスク－開所式の際に発行された記念冊子－”(Nagoya Muslim Mosuku – Kaishoshiki no sai ni hakkou sareta kinen sasshi – )(published in January, 1937 by Nagoya Toruko・Tatar Islam Kyoukai ), it is stated that the Tatars then established a new Mosque in 3 choume, Imaike-chou, Nagoya in November 1936, after receiving donations from Muslims in India and Manchuria. The inauguration ceremony was held in January 1937. The Mosque was built as a 2 story wooden mortar building on a 40m² land. It faced the road, with around two stone steps to reach the entrance. 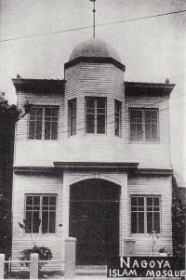 The first floor served as the prayer room, and the second floor as a school for Turkish children. On May 14th, 1945, airstrikes from US military aircraft B26 burnt down the Mosque. Hamidlin, who is named as the Chairman of the Construction Committee in the document mentioned above, directly negotiated and sold the land, that has become a small field of burnt-out ruins, to a Japanese neighbor. Since then, Nagoya did not see a Mosque for the next 53 years. Copyright © Islamic Center of Nagoya Masjid Nagoya All Rights Reserved.